Ah, the puzzle game, the bread and butter of the App Store. It’s the dream of many a developer to come up with an original game that’s simple to learn, hard to master, and hopelessly addictive to play. Twistrix is a decent attempt at this holy trinity of iPhone gaming, although still far behind the likes of Bejeweled 2. 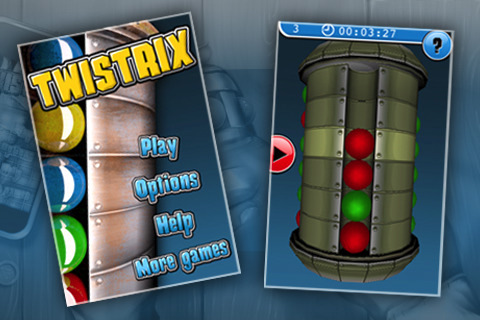 A classic puzzler in the spirit of Hanoi or Unblock Me, Twistrix relies on your wits to unlock a mechanical puzzle. You start with a column made up of several rings, which you can rotate independently around a central axis. Along the column are lines of empty spaces and multicolored balls that you can slide up and down along the rings. The general idea is to slide and twist things around until you’ve lined up all the balls of the same color. The actual gameplay is quite nice, as the mechanism is simple and easy to use. Just a swipe of a finger along the balls and they shift up or down. Do the same to twist the rings right or left, and they click into place satisfyingly, and you can shift the entire column by swiping along the bottom. The graphics are bright and clean, and there’s a little music to round it all out, so the general package is very neat and appealing, but it has a few problems. There is a clock that tracks how long you take to complete each puzzle, but it didn’t seem to have any bearing on the game, and there’s no way to see your time at the end, so it seemed to serve no real purpose. It would have been nice to be able to compare your time against others or try to beat your score. There is also no easy way of resetting the level once you’ve started it, something which might have come in handy after getting completely mixed up once or twice. But Twistrix’s biggest issue, hands down, is the tutorial. Totally text-free, you have to sit through a video demonstration of an entire level, and it takes forever. I understood the gameplay within 5 seconds of watching the tutorial, so I closed it and started playing, but after lining up all the balls, I couldn’t figure out how to end the level! So I went back to the tutorial and had to watch 5 minutes of everything I just did before I could see, “Oh, I have to push all the balls down to the bottom, not the top.” I would have much rather seen a couple of slides with text or had instructions walking me through a beginning level instead of watching an agonizingly slow video. Once that was done, I found the game quite clear, challenging, and fun, but getting over the first hurdle was definitely the hardest. AppSafari review of Twistrix was written by Tracy Yonemoto on March 26th, 2010 and categorized under App Store, Fun, Games, Puzzler. Page viewed 3202 times, 1 so far today. Need help on using these apps? Please read the Help Page.